Home > Travel guide > Why we are come to discover Dong Van stone plateau? Why we are come to discover Dong Van stone plateau? You love travel! you want to discover. Come to Dong van stone plateau of Ha Giang city. To the majestic nature. the winding roads under the ridge.The small house is located deep inside the cliff. It will certainly make you excited during your journey. Why would we want to go there? Spread over 4 mountainous districts of Ha Giang , Dong Van Plateau including Quan Ba , Yen Minh, Meo Vac , Dong Van . 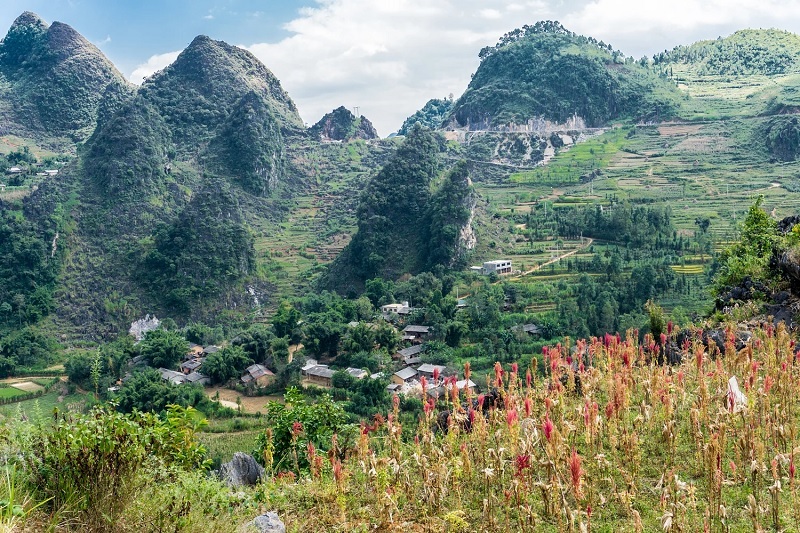 Situated at an average elevation of 1,000 - 1,600 m over sea level , in an area of over 574 km2 of geological diversity Plateau is unique in Vietnam . It also has a series of rock formations, old over half a billion years ago . Especially close to a dozen units of limestone are very different , with a total thickness of approximately 4,000 meters . Search found 1,000 fossil species , including some endemic to the region . This is also where the record evidence of two major events in the world of mass destruction biological world on a global scale occurred here about 250 and 350 million years . . Ha Giang is home to many unique cultural products from a long tradition of ethnic churches, H'mong , Tay, Dao , Nung , Lo Lo . to Ha Giang , tourists can see the product crystallized from the unique cultural traditions of the mountain , which is embroidered cloths , fabric , dresses with flowers of brilliant. Importan now in Ha giang still keep natural, quiet, not a lot tourist. 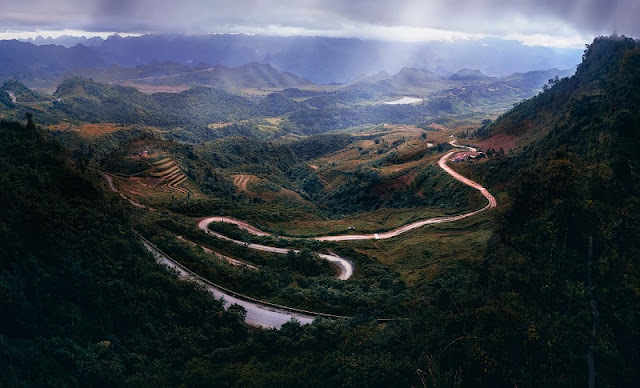 “The Happy Route” is the name given by the 1st President of Vietnam Ho Chi Minh to the National Route 4C, connecting Ha Giang to four remote districts on the north of the highland including Quan Ba, Yen Minh, Dong Van and Meo Vac. 185km in length, 4C’s construction began in Sep 1959 and was completed on Mar 1965. The route was finished with the great contribution of thousands of people from thanh nien xung phong (Volunteer Youth, an organization of Vietnam young people operated under the guidance of Vietnam government) and labors of eight provinces in northern Vietnam at that time. 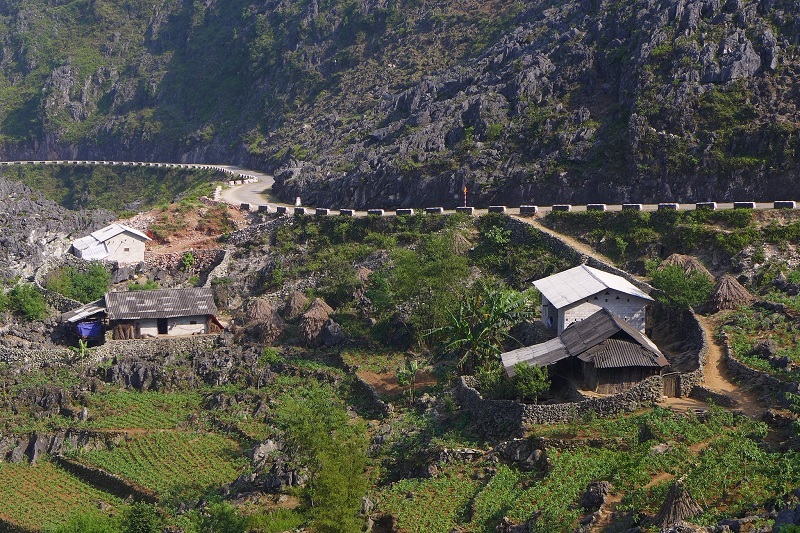 This is one of a very few routes in Vietnam that have the whole process of construction completed entirely by human. In over 2 million of working days, more than 3 million cubic meters of rocks had been removed without the help of any machinery.